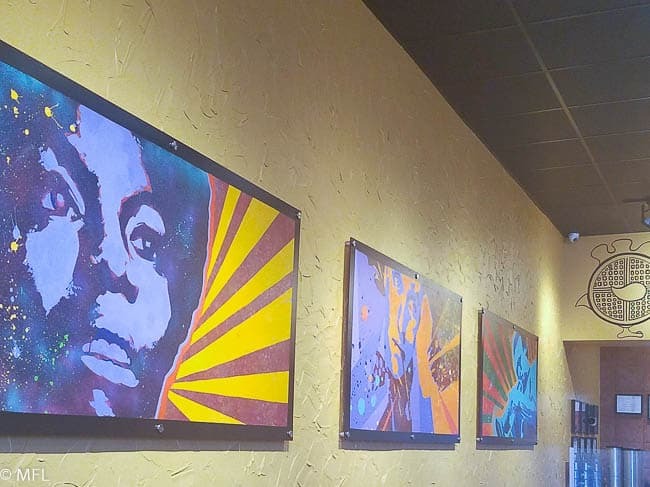 I had the opportunity to dine and relax at Dame’s Chicken and Waffles Cary, NC. This new location is perfect for those that are looking for delicious Dame’s entrees in a new bigger location. I usually don’t venture outside of Charlotte when it comes to my restaurant escapades, but when a friend becomes co-owner of a restaurant, I have to go check it out. 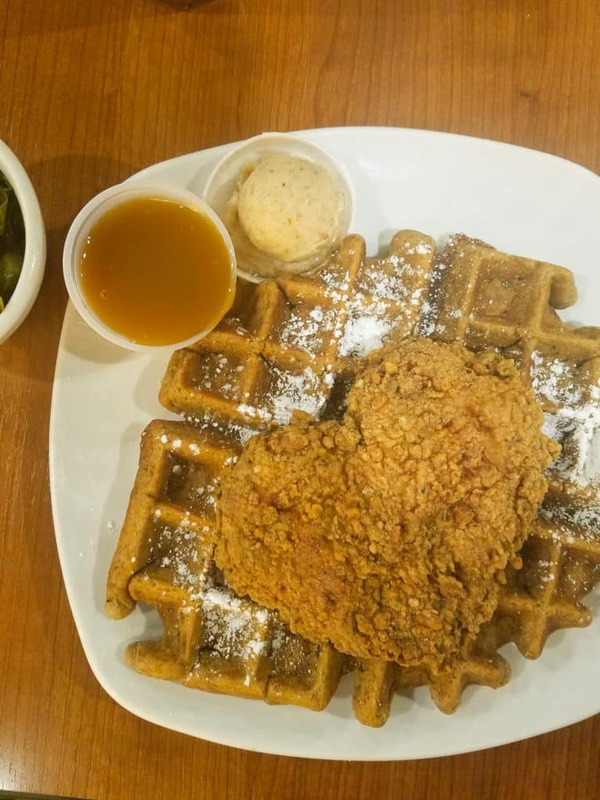 Dame’s Chicken and Waffles is pretty much a household name around North Carolina with locations in Durham, Greensboro, and now Cary, NC. When I heard Dame’s would open in Cary, NC, I immediately got jealous. I’ve been waiting for them to open in Charlotte for years. But I digress…folks in Cary are lucky to have this location. I had to travel to the Triangle for work and realized that it would be a great time to catch up with my law school study group who are more like close friends rather than just old study partners. Ironically, on the morning of our planned dinner, Facebook reminded me that 10 years earlier we took a photo during out first year of law school. The majority of these friends are in private practice, one is an assistant public defender (me), 2 are bloggers, and one became co-owner of Dame’s Chicken and Waffles Cary, NC. Dame’s became the obvious location for us to grab a bite and catch up. I arrived at Dame’s at 7pm on a Tuesday. This location is located in a shopping center which makes parking easy. I was out of my car and at the front doors of the restaurant in no time. Once I walked in, the atmosphere of Dame’s was perfect for our law school reunion. This place is much bigger than the Durham location. I immediately noticed this amazing artwork on the wall. It’s painted by a local Durham artist, Artie Barksdale. Kuddos to Dame’s for keeping it local. In the background, D.J. Pandora was spinning a nice jazz mix and I realized that this was a place I could relax, have great conversation, and eat. 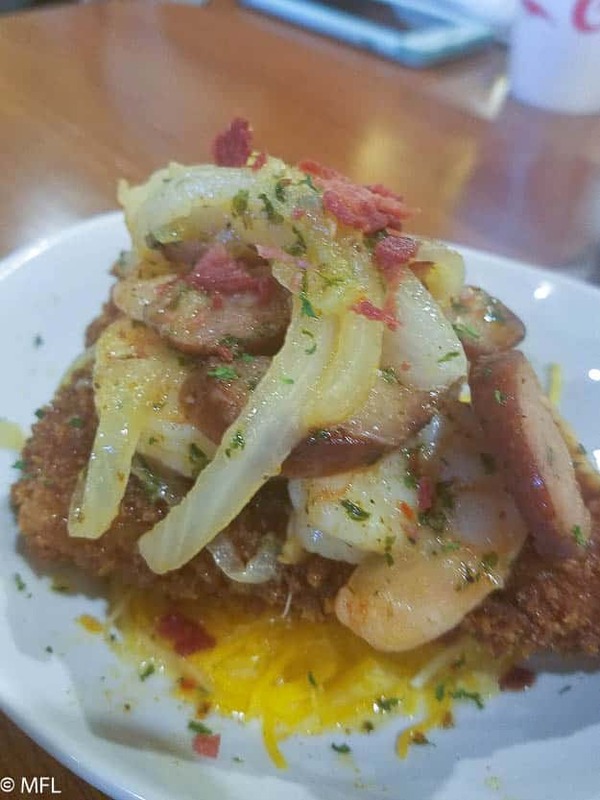 We started our meal at Dame’s in Cary with this twist on your traditional Shrimp and Grits. This version is made with a grit cake and it was my first time trying it. It’s a spin on the classic grits as the outside is fried and the inside is filled with creamy grits. I loved this spin and the flavor was on point. We next moved on to our entrees and almost everyone ordered chicken and waffles. 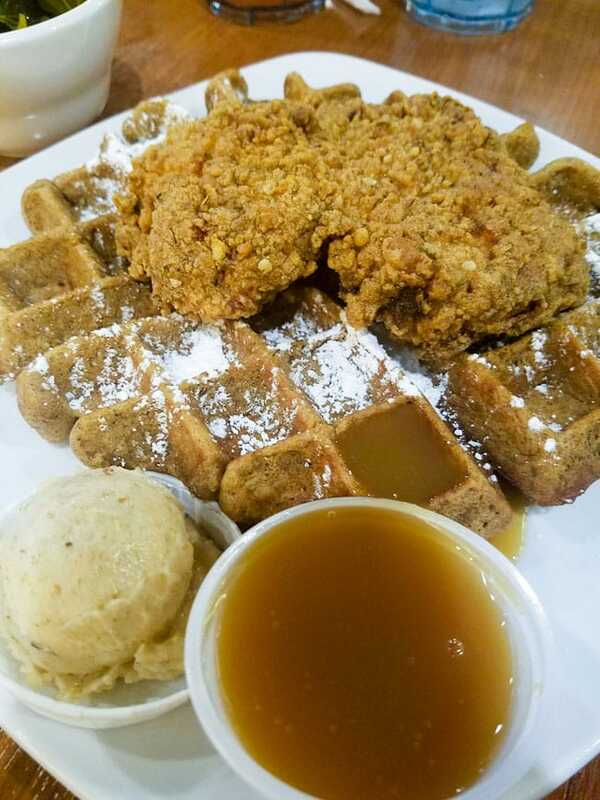 Dame’s doesn’t serve your typical Chicken and Waffles. The menu offers great variety and combinations that it’s hard to pick just one. 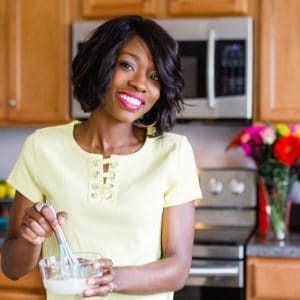 Waffles range from sweet potato, gingerbread, and vegan while there are a variety of drizzles and smears that come along with it. The menu at Dame’s comes is filled with suggestions but feel free to change it up, I know I did. All food is made fresh and we got our orders delivered to our table in really good time. I ordered the gingerbread waffle with vanilla almond smear and sweet whiskey creme drizzle. It was amazing!!! The other cool thing is that my chicken breast was shaped like a heart. It’s so good to be loved 🙂 I also ordered some of the calypso sauce to dip my chicken in which provided a nice spice to my meal. Each chicken and waffle entree comes with a side, which most restaurants don’t offer in a chicken and waffles special. 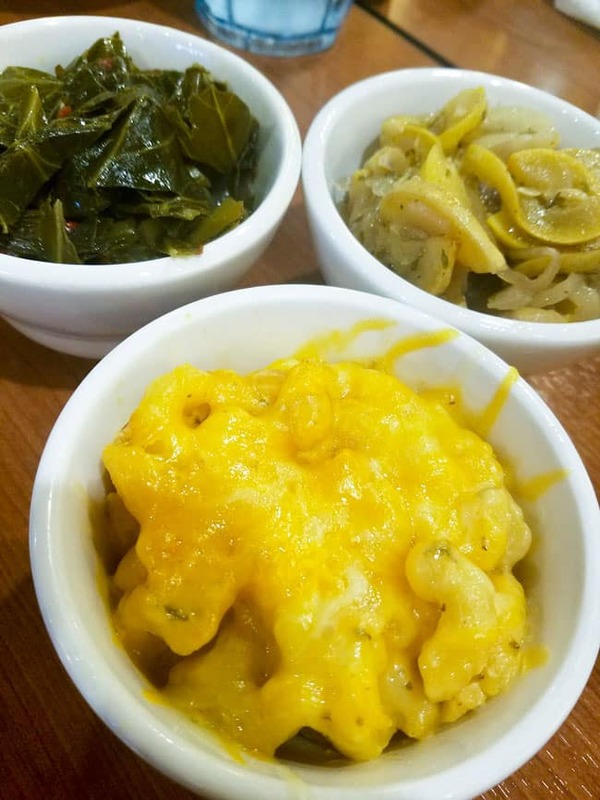 I ordered the spicy collards and they were absolutely amazing! I don’t usually do collards but these were so good. So full of flavor and just the right touch of spice. 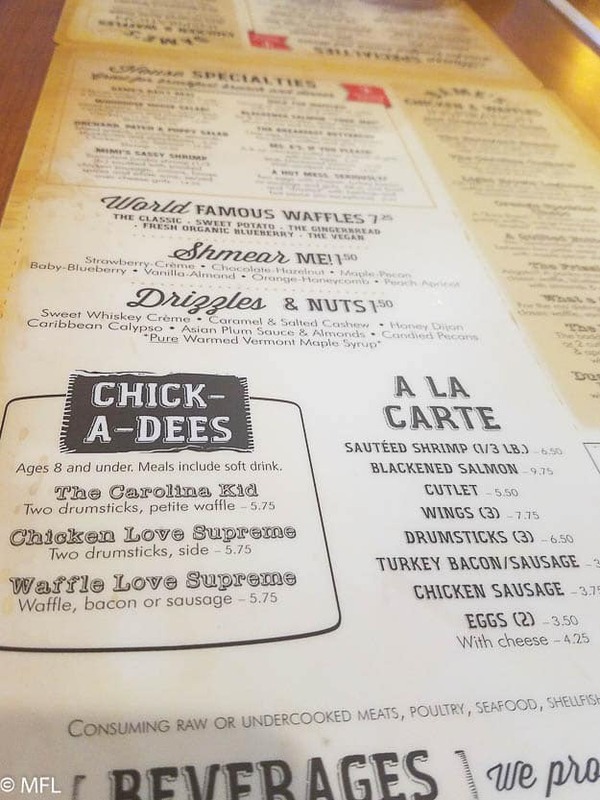 Overall, my experience at Dame’s Chicken and Waffles in Cary, NC was great. The only sad face moment was that they didn’t serve alcohol but a little birdie told me that is coming soon. If you’ve been to any Dame’s, you know that the drinks are delicious. I’m sure the ones here will be as well. So for you lucky folks in Cary, you have a wonderful gem in your city. As for me, I’ll still dream of the day Dame’s decides to open a location next door to my house. A girl can dream can’t she.